Brigueuil is an almost impossibly picturesque little village that's found in the Charente department of Poitou-Charentes. Occupied since Roman times, the village has a long history and several monuments. Brigueuil enjoys an idyllic setting too, in a lush, green land of pastoral countryside, rivers, lakes and woodlands. The overall effect is one of tranquillity, yet everything you need remains within easy reach. The heritage includes a church, Saint Martial, which is a listed historical monument, the Lantern of the Dead monument in the cemetery, also listed, and a castle. When it comes to natural heritage, Brigueuil is no slouch either. The Forest of Brigueuil is a natural haven for flora and fauna, and makes a beautiful backdrop to the village. While many small French villages have little in the way of amenities, Brigueuil is well equipped with a handy mini supermarket, a boulangerie and a butchers shop. It's even got a bar and a restaurant for those times when you feel like treating yourself and don't want to stray far from home. The Charente is a wonderful department, and it and its neighbours offer many great places to visit and have ideas for all kind of days out. There are nearby attractions to suit all ages and interests, from the natural pursuits of walking, swimming and horse-riding through to golf, quad biking and theme parks. One place not to be missed is the city of Poitiers, packed with interest and heritage. Then there's its fabulous educational theme park, Futuroscope, and nearby a delightful monkey park where hundreds of monkeys can be seen enjoying a natural environment. The market town of Angoulême is always lively and good to discover. All along the way, whatever direction you take from Brigueuil, there are pretty villages and hamlets, monuments and glorious views to see. You'll never be stuck for something to do! Flying will get you to Limoges and Poitiers, the latter being slightly further away. Poitiers has a TGV station too (as does Angoulême which is closer), for those who prefer the train. Drivers can access the village from the D30, not far from the N141 non toll motorway. Poitou-Charentes and Brigueuil property prices often come as a pleasant surprise to house hunters, as you can get so much for your money! 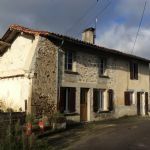 It's currently possible to find lovely properties in Brigueuil, ready to move into, for only just over 100,000 Euros, so make the most of it while it lasts and buy in 2013! Do you know Brigueuil better than we do? Do you have photos of Brigueuil? Brigueuil is situated in the west of France. It lies in the north-east of the Charente department. Access: By air: Fly to Limoges or even Poitiers. By rail: The TGV runs into Poitiers and also to Angoulême, so fast train travel is another option. By road: The village lies on the D30, near to the N141 non toll motorway. Economy: The economy is rural and agricultural, with small commerce present. There is a sheepskin leather workshop in the village. Interesting fact: The remains of a Roman villa were found near to Brigueuil.